It’s a new book…. If you haven’t read it! Paula McLain is the author of several novels (including two poetry books), and the international best seller (2012) The Paris Wife. She has definitely found her niche writing gorgeous stories about interesting women. Her writing is richly evocative of time and place, the engaging characters are well developed, however famous, and they are well researched. 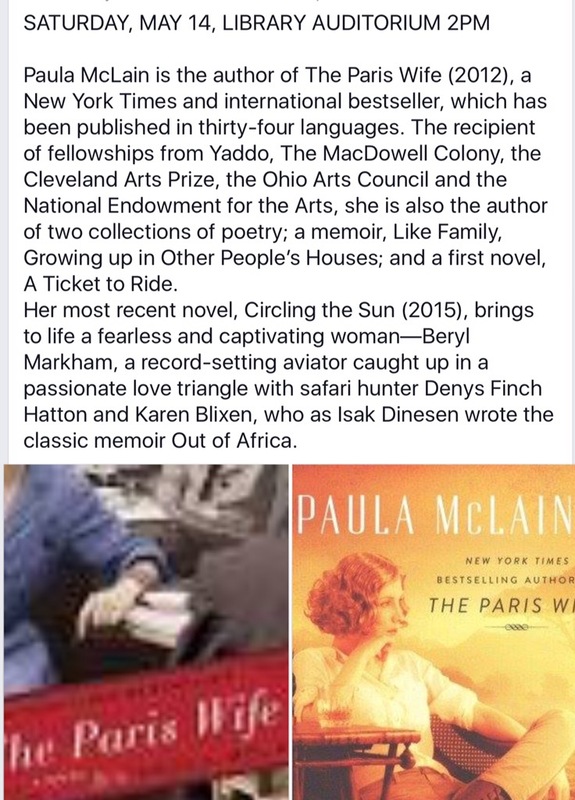 Her books, best sellers and NYTimes listed, have won notable awards and nominations; NPR named Circling the Sun one of the best books of 2015. Film rights have been optioned! Much of the story takes place in Kenya, Africa during the 1920s and 1930s. This is a short chapter in the life of Beryl Markham, ending with her transatlantic flight in 1936 (she lived another 50). Her life is full of bad choices and tragedy, but also held together by an indomitable spirit. Her love of Africa was a driving force, while social conventions were mostly to be ignored. So although this is white colonial Africa, she appears to be a much more modern, complicated woman. I thought her unruly girlhood (wild Masai tribe) was a rather romanticized, but the social frustration with conventional expectations were truly appalling. I keep thinking how far we’ve come, and then wondering if we really have. She was an extraordinary woman, adventurer and aviator. Her story deserves to be more widely known. She was the first and youngest woman to be a licensed horse trainer and the first woman to fly solo transatlantic (east to west), 1936). While Beryl is the main character, Africa is an immense, constant presence, beautifully detailed and enjoyed by the reader. I also love her realistic descriptions of flying, which also show the love affair with the African landscape. This would be a perfect summer read. Prologue 1936. The Vega Gull is peacock blue with silver wings, more splendid than any bird I’ve known, and somehow mine to fly. First Line 1904. Before Kenya was Kenya, when it was millions of years old and yet somehow still new, the name belonged only to our most magnificent mountain. Being a column about previously published books. Perhaps recently reissued, issued in paperpback, just discovered or recently recommended. Don’t miss this author visit! !